As you might guess, I’ve been following the Tour de France over the last week. In fact, coverage of this morning’s time trial is playing in the background as I write this. At one level, the Tour de France is fairly boring—even if the scenery is beautiful. At the same time, I have long found it strangely compelling. I remember watching Greg Lemond’s dramatic time trial on the last day of the 1989 Tour. Lemond was coming back from a near-fatal shotgun injury a couple years earlier. 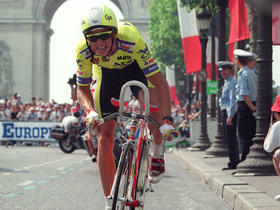 After over 2,000 miles, 50 seconds separated Lemond and Laurent Fignon, a renowned time-trial cyclist. I also remember tearing up as Lemond overcame what was considered an impossibly large time deficit to defeat Fignon by 8 seconds. Even today, I find watching that video enthralling. What is it about sports that I (and billions of others) find so compelling? In the case of cycling or basketball, it might be because I love or have loved participating in the sport and so identify with the participants. I don’t claim to be able to ride anywhere near as fast as Greg Lemond or to have the post-up moves of Charles Barkley, but I at least have some idea what they are doing. On the other hand, I find sports like soccer or football compelling even though I really have little idea what playing them is like. I think there is something in our basic nature that identifies with competing. Especially with competing against a superior opponent. Over the weekend I watched a documentary, I Am, recommended by a good friend. The movie was generally good, but at one point it tried to contend that human nature is cooperative, not competitive. The Bible, and my observation of human nature, indicate that quite the contrary, human nature is largely competitive. David’s battle against Goliath is something that resonates with us at a very deep level. Is competitiveness wrong? While David defeating Goliath was good triumphing over evil, Cain and Abel was not. I think it is safe to say that it depends what one is competing against. But, what about sports where there generally is not a good versus evil motif? If you think maybe that the Miami Heat is evil, what about children’s soccer teams or church basketball leagues? Is that kind of competition something to be encouraged or avoided? In the Bible, Paul uses sports metaphors to describe aspects of living a Christian life. In 1 Corinthians 9:24-27, Paul says, “Do you not know that those who run in a race all run, but only one receives the prize? Run in such a way that you may win. Everyone who competes in the games exercises self-control in all things. They then do it to receive a perishable wreath, but we an imperishable. There I run in such a way, as not without aim; I box in such a way, as not beating the air; but I discipline my body and make it my slave, so that, after I have preached to others, I myself will not be disqualified.” Paul in other places talks about running a good race and fighting a good fight. He seems to view at least parts of sports to be commendable. There is real value in disciplining our bodies (and minds) in the pursuit of excellence—both in the Christian life and in competitive sports. Based on that, I plan to try to improve my bicycle riding abilities, even as I age. And, I plan to cheer on athletes who dedicate themselves to pursuing goals. I will try to keep in mind that the goal is not victory at all costs, but rather the discipline that comes from sport. That means I’ll try keep perspective and remember that cycling needs to be kept in the proper place in my life. And, to choose the competitors I root for not just based on where I live or whether they win. Go Spurs! And, go whomever is actually not cheating in cycling!